Coffee — one of the most important beverages in American society. We use it to jump start our morning, relax from a stressful day, or to just enjoy its flavor, aroma and taste. When perusing the coffee aisle of your local grocery store, there are countless of options to choose from. There are different beans, with a multiple range of roasts, in a variety of blends. So which one is the right choice for you? 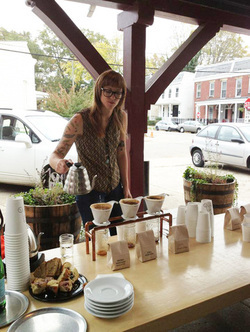 Noelle Archibald, co-owner of Lamplighter Coffee Roasting Company in Richmond, Virginia, helps break down the complexities of the beloved beverage and gives us tips on creating the perfect Cup of Joe. 1. What is Coffee? What is the process from when it’s picked off a tree to what we buy in the store? When coffee is bought off the shelf, most people don’t think of it as coming from an organic plant. It’s two little seeds that grow inside a cherry on a shrub-like tree. The cherries have to be hand picked and the seeds removed through either “dry” or “wet “ processing. The different ways the seeds are removed from the fruit effect the flavor. Once the beans are processed, they are in a green state and can stay fresh from 6 to 9 months. Once the beans are roasted, the beans will start releasing their flavors. We cup them at 24 hours to determine the quality and by 48 hours we serve them to our customers. From day 2-6, the beans are at their peak and you are going to get the best flavor from them. After that, the quality begins to downgrade. You can keep the beans for up to two weeks before they go stale. 2. What should you look for when buying coffee? Taste is preference. If you like bright, citrusy, fruity flavors, you might want a light roasted African coffee. If you like low acidity, chocolaty, rich tones, you might like an Indonesian coffee. You look for the coffee that has the flavors you like. Find a whole bean coffee and keep it in an airtight container, away from sunlight. As soon as you grind it, the coffee releases gases and expels wonderful aroma and flavors. If you brew the coffee two minutes after grinding it with water that’s less than boiling, you capture all that essence into your cup. 3. What are some home-friendly brewing techniques, and what different flavors do they produce? When you’re brewing coffee, you’re trying to capture the essence of its flavor. If you like a really heavy, rich taste, you are going to want to find a preparation method that highlights those flavors. Full submersion methods like a French press, draws out the most oils and fats out of the beans, and leaves a lingering finish in your mouth. Other people who like a crisp, clean, brighter cup, can try the pour over method, which filters out the oils and sediments, and gets more of the upper top flavor of the beans. 4. What is some basic coffee equipment you should have in your kitchen? Making coffee doesn’t have to be difficult. Use any simple method you enjoy. All you need is a decent grinder that chops up the beans up in even sizes, hot water that’s just below boiling, and a brewing device. People think it’s difficult, but if you learn your own palette and set your own brew ratios by measuring what you do then you can consistently achieve the same kinds of results from a coffee shop at home. So now that you’ve been educated on the coffee basics, brewing your Cup of Joe in the morning should be relatively easy. With a variety of blends on the market and different brewing techniques, the process doesn’t have to be complicated. The fun thing about coffee is it depends on your personnel preference, so experiment in finding the blend that’s right for you.